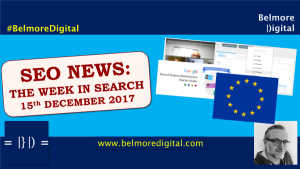 What are the latest SEO News & Updates for w/e 17th November 2017? 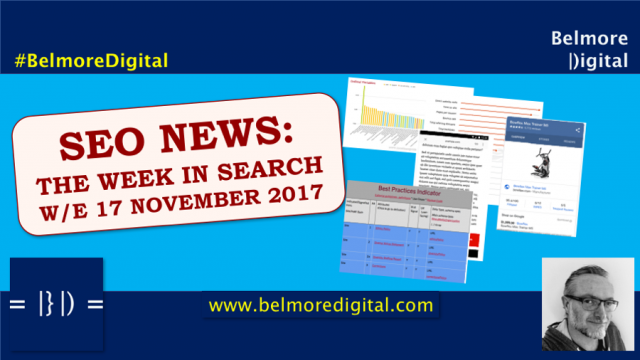 I’m excited by this week’s SEO News and Updates by a factor of 84. That’s roughly how many ranking factors have been covered by major providers. The team from Local SEO Guide have released a really good Local SEO Ranking Factors Study for 2017. Reviews are clearly the most important factor in Local SEO – not just on Google, and not just the number, but those with keywords, location mentions, and importantly responses. Traditional links are important, even though most local businesses have what might be termed poor link-profiles. Having an optimised website is really super-important as well – don’t forget that, or think that you can live in other people’s houses (Google, Facebook, Yelp etc). The study hasn’t had any Machine Learning applied, so misses a trick. Time to focus on reviews, if you haven’t been already. Make sure you aren’t soliciting Yelp reviews, but for the rest, asking seems to be fine. Once you have reviews, respond to them, engage with them. Build your local link profile with local sites. They are highly relevant, even if not always the best quality. Add structured data to your website. Click here to contact me to discuss how to optimise your website and local listings to rank well in Local SEO. This is a big week for Ranking Factors Studies. At least this one isn’t quite as contentious. The team at Local SEO Guide are great, wise and sensible people and as a whole I pretty much agree with what they say, and have been advising clients similarly for the last little while. Reviews are such a big thing because they are crowd-soourced, nominally independent and “real”. They’re like a link, but real people have (nominally) given them. I am quite surprised no one has yet started an auto-review generator. When you consider the amount of bot driven actions in online ads, it must be possible. I think the big gap in the study is the impact, or otherwise of structured data. Even though it is not a direct ranking factor, using it enables information about your business, product, or service to be efficiently retrieved and stored, and as it is controlled by the business, it can be controlled at a wider a scale. Businesses which have the correct data aggregated across multiple data sets are likely to see increased power from that data and increased exposure as a result. I’m also a bit surprised about the commentary about most local links being low-quality. They are only low quality when you take into account traditional, but pointless and arbitrary, authority metrics. If you approach them from a relevancy standpoint, they are often high-quality, being real, genuine, homespun ways to organise data in the local area. Remember links are at least two-factoral: relevance and quality with relevance outweighing quality significantly. SEMRush has released its second ranking factor study for the year, listing what it believes to be the 17 most important ranking factors. The data was pulled from 600k keywords and analysed against a different statistical analysis from pure correlation. The starkest conclusion was that direct traffic was the most important ranking factor. This caused a bit of a stir in the SEO community! Head to SEMRush and download the full study. It is interesting reading. Read it with a weather eye and understand its limitations. The top 4 ranking factors are products of great content. Think about that. And then build great content, which people want to engage with, read more of, which meets user needs. 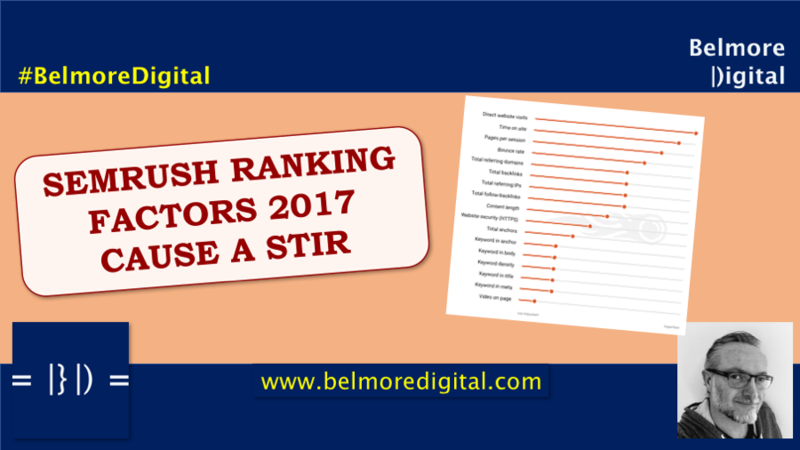 Click here to contact me to discuss how to interpret the SEM Rush Ranking Factors report. I’ve got immense respect for people who put out these studies, even when they suspect they may get pilloried because of them. As I’ve posted elsewhere, levels of Direct Traffic traffic are not a prerequisite for ranking well in organic search. 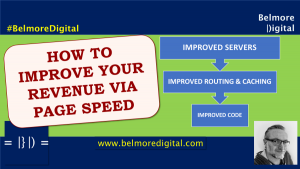 To truly establish that you would have to consider all websites’ Direct Traffic levels and then consider how many of them perform well, and how many of them don’t. It’s likely as many sites with huge volumes of Direct Traffic perform poorly. 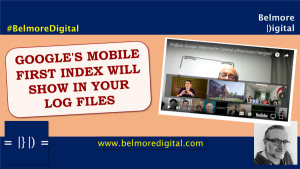 It is, however, an indicator that you are likely to perform well, because big, popular sites tend to accrue more links, tend to accrue more mentions and, generally, tend to be expected to appear in search results. 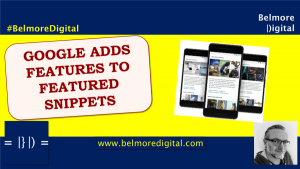 Google has made it plainer over the years that users have certain expectations that certain websites will appear in SERPs and have engineered their algorithms to facilitate that. As I say above, the top 4 factors of direct traffic, time on site, pages per session and bounce rate are factors of great sites with great content, so if you really want to take something away from the study, you should be looking at building a great site with great content which really focuses on the user first, middle and last. Everything else is secondary. That said, if Google only focused on popular sites, then their rankings would become a popularity contest where only the biggest brands which can reach the most people could rank. And we really don’t want that. It’d be like DMOZ all over again. Just in time for Shopping Christmas Season, Google has updated its mobile Product Knowledge Panels massively. 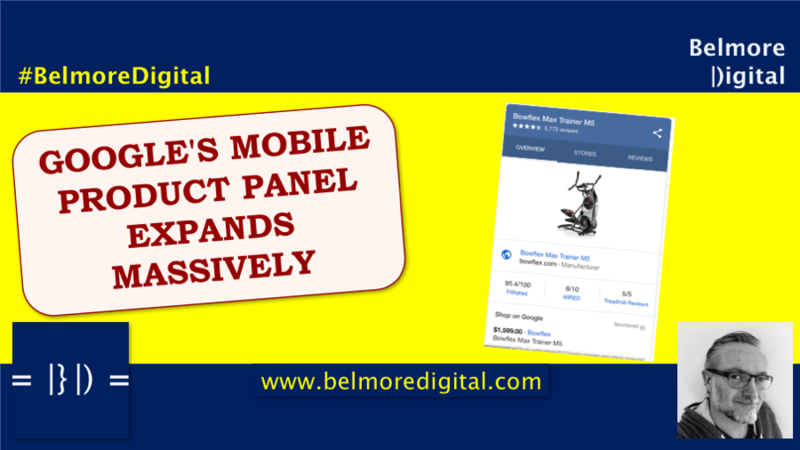 These now take up a significant portion of a mobile display, and of course, add enhanced advertising display, with direct Adwords ads and Google Shopping ads. There is now some more real estate given to reviews and product images, so it’s not all advertising, just that ads take up prime space. 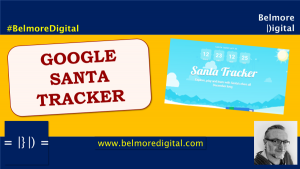 If you’re an e-commerce retailer operating in the product space, you may be in for a scrooge-like Christmas, as these expanded panels push your SERP results further down the page. You may need to take really active steps to consider ways to appear in the panels. I hate to say advertise on Google Shopping, but that may be the only way. Of course, having an extensive review infrastructure and authority in the reviews space is another way, but that takes a while to build (understatement). The other way to sell through to this traffic is vertical search. If Google is sending traffic to other vertical sites, advertise there. Other than that, wish Google a Merry Christmas! Click here to contact me to discuss ways to get your retail store in front of consumers this Christmas. Every year for as long as I can remember Google has updated around this time of year to give a more ecommerce feel to SERPs. This has included pushing retailers further up in SERP. Giving more real estate to ads and generally enabling consumers to search and buy more easily. I’m still undecided over whether this is a good thing. Traditionally, these updates have favoured big retailers over little ones, and this update is no real difference. Those with big budgets for advertising, or big infrastructure to appear in the knowledge panels will win. Those without won’t. It doesn’t always feel like the best results surface any more. I know that a lot of jaded SEO cynics have long felt this, and to an extent they are right, but this feels like a naked land-grab which may not revert after the shopping season. After all, users are used to it by then. Now, about that large Google Shopping EU Fine business. You still think that’s over-reach? In a long-foreshadowed crackdown, Google will start penalising sites where the AMP content does not have “content parity” with the canonical URL. This will come into effect in February 2018, giving naughty news publishers plenty of time to adjust. This is not an alteration of their ranking policy, although the net effect is that websites wil wildly different AMP / canonical content will no longer rank. This is to deal with publishers who are only giving “teaser” content on their AMP pages. It will be interesting to see if Google chooses not to rank the canonical, or if it wants the canonical in preference to the AMP version. Review your AMP content. It should be at content parity with the canonical URL. You should modify any AMP pages which use a “teaser” style of content to allow full content on the page. You have nearly three months to action this, so get on with it. 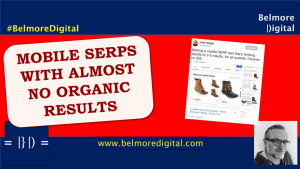 Click here to contact me to discuss how to use AMP pages properly to rank in organic search. Clearly, Google is feeling slightly abused by news publishers, who in turn feel abused by Google. 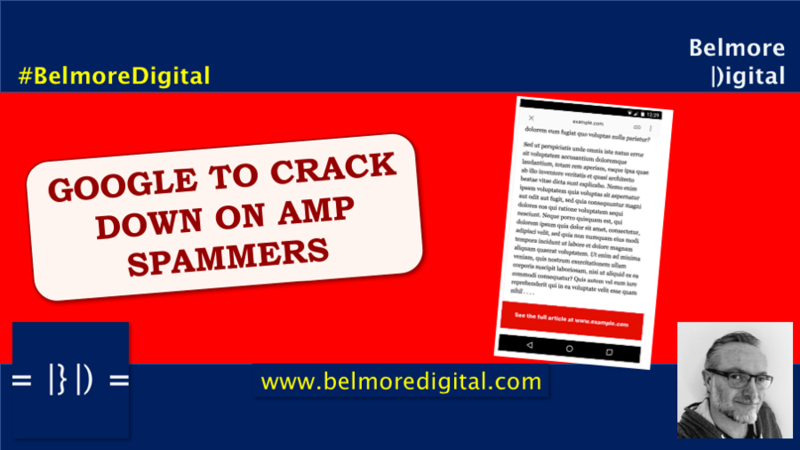 Some of them have been creating AMP pages which only have a couple of paragraphs of content before enticing the user to click to the website, or elsewhere. This is clearly an abuse of the intent of AMP. Google must be feeling confident that publishers will not abandon AMP in droves as a result, or that the problem is not widespread enough that their listings will be severely impacted by not displaying these pages. The (rare) advanced notification must mean that there are some major publishers who are doing this, who are likely to need appropriate time to retool their output. You can also imagine Google is saying “hey guys, we’ve done a lot for you recently….”. 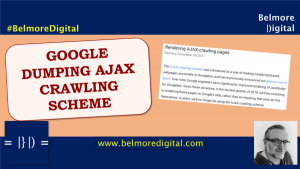 One of the really interesting things to see will be whether Google replaces offending AMP URLs with the canonical page, or whether the canonical page will be prevented from listing. As they say it is not a ranking policy change, you’d imagine the canonical URL will be shown. Google Maps is getting a redesign! Cue anguished wailing from all over the web as user’s lives are ruined, ruined I say. I don’t think this is earth-shattering, but you do have to question the UI & UX of a redesign that needs an extensive cheat sheet to explain its symbols. Particularly when its symbol for cemetery looks suspiciously like a road sign for a picnic spot. Facebook is giving another stab at Local by revamping its Events app (what’s that?) into some sort of Local hybrid. It baffles me that Facebook fails so magnificently at local. Perhaps because its users don’t know how to search and Facebook is just not that good at aggregating and displaying information – unlike monetising that information. Google reminds webmasters that it is still making changes to its Panda and Penguin algorithms. Considering these are core algorithms, do people really think they are static? This week Google says you can use a Disavow if it makes you feel better. I get the feeling they are getting fed up with telling people not to bother. 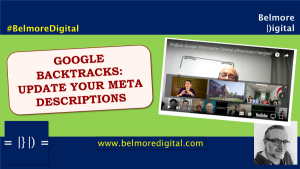 Historically, Google ignored poor links to your website, but included them. Now it just ignores them. 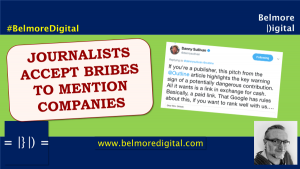 In a really good, but slightly flawed article, SE Land talks about how PBNs (Private Blog Networks) can get you penalised. In short, don’t use them folks. 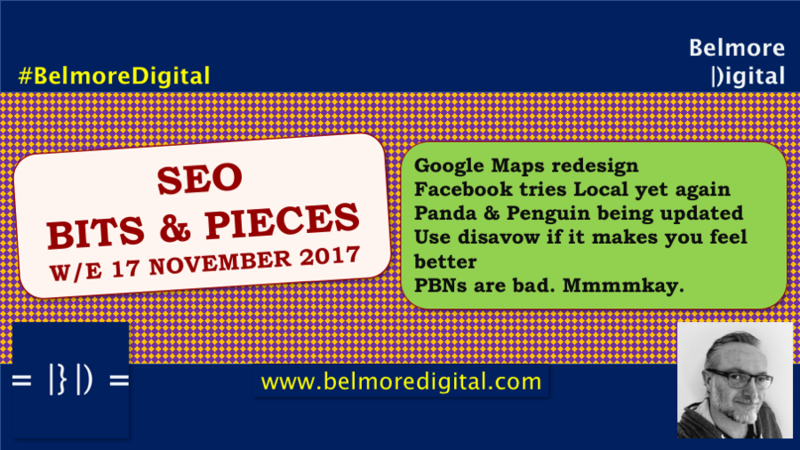 The flaw is that PBNs are relatively easy to spot & if I can spot them, Google can. The other flaw with the article is the missing piece about “follow the money”. 9 times out of 10 the PBNs will be monetised to the same ad codes. Simples. 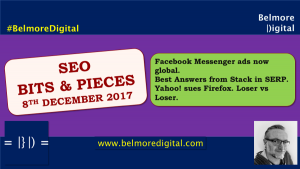 Click here to contact me to discuss any of these SEO Bits & Pieces further. 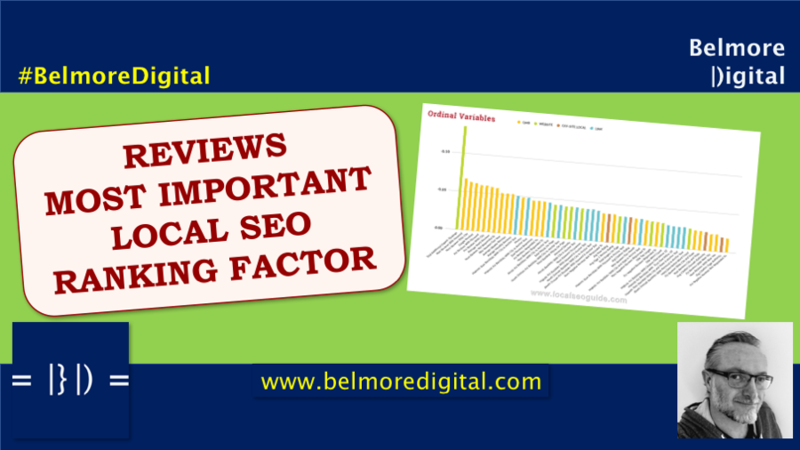 Reviews are big news in Local SEO & the most important ranking factor. SEMRush’s SEO Ranking Factors Study shows surprising results. Google’s expands mobile product panels with ads just in time for the shopping season. 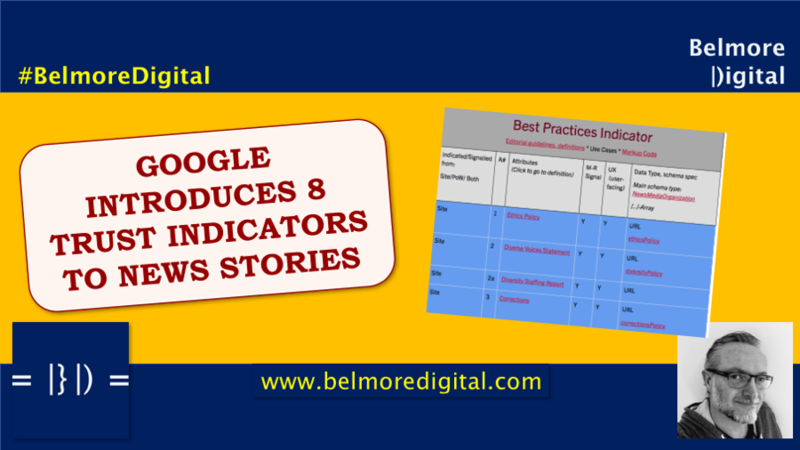 Trust indicators are coming to Google News via schema markup. The ban hammer is coming out for AMP spammers. In February 2018. And some delightful SEO Bits & Pieces.